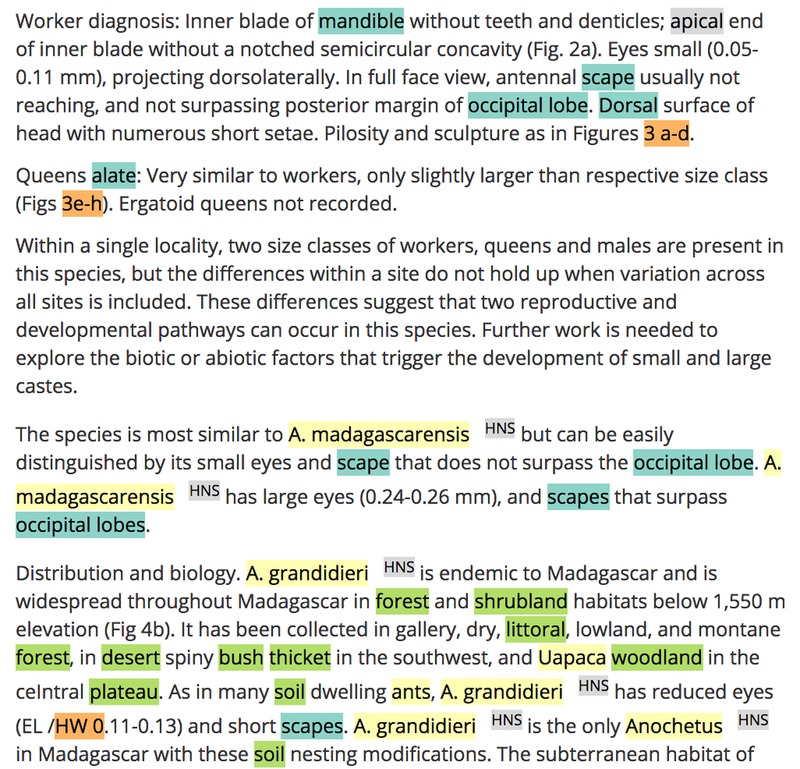 Selected-text-based extraction: a. select a piece of text of interest in a web page and then b. click on the bookmarklet. c. A pop-up, such as the one shown on the left image below, will appear (supported browsers: Chrome, Firefox, Safari, Opera, Internet Explorer). By hovering the mouse cursor over the text tags or the table rows you can visually inspect which words have been identified as which entities. 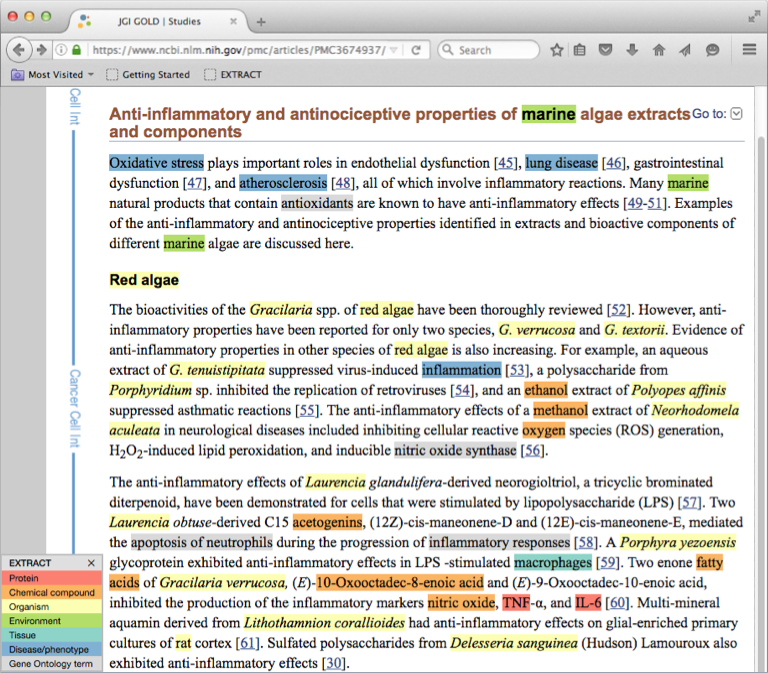 To easily collect extracted annotations, e.g. for use in an Excel spreadsheet, direct Copy to clipboard and Save to file (tab-delimited) are supported. Full page tagging: if you would like to get a quick and visual overview of the web page sections containing environmental context information just click on the bookmarklet without having selected any pieces of text. The complete page will be tagged and identified entities will be highlighted (see the right image below and the example). Points in blue are a good starting point as they provide you with basic information about the EXTRACT bookmarklet, such as how to install and use the bookmarklet, and the EXTRACT popup description. Some points about record annotation with standardized metadata are listed afterwards (in green), followed by troubleshooting cases (in orange). Information on how to use EXTRACT within other resources can be found at the end (in purple). ⚠ Your bookmark bar may not be shown by default in your web browser. Please see "Where do I find the browser bookmark bar?" on how to enable it. you can easily spot environments in which this ant species occurs (in bright green) and key anatomical key anatomical features of the species and its casts (in teal). 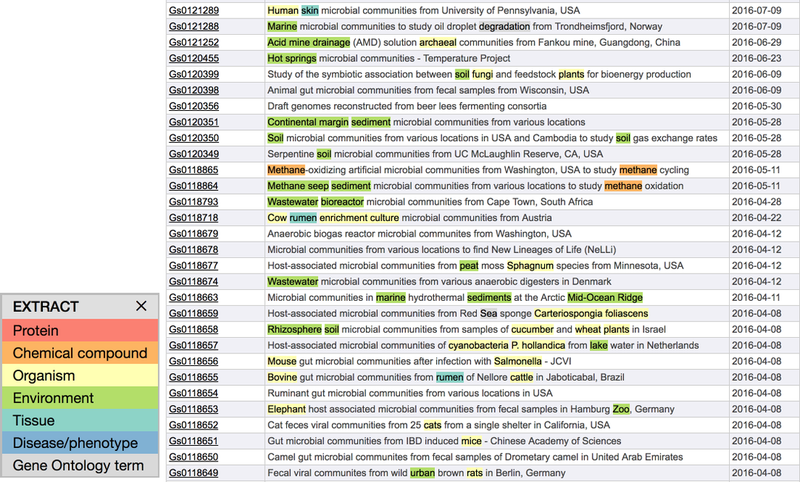 of metagenomics studies in the Genomes OnLine Database. For more details on the how to implement the last point see section "Can I invoke the EXTRACT tagger programmatically?". () mentioning your browser, operating system and the address of the web page you are trying to process. In case you are connected to the internet from behind a firewall, please see the next point. 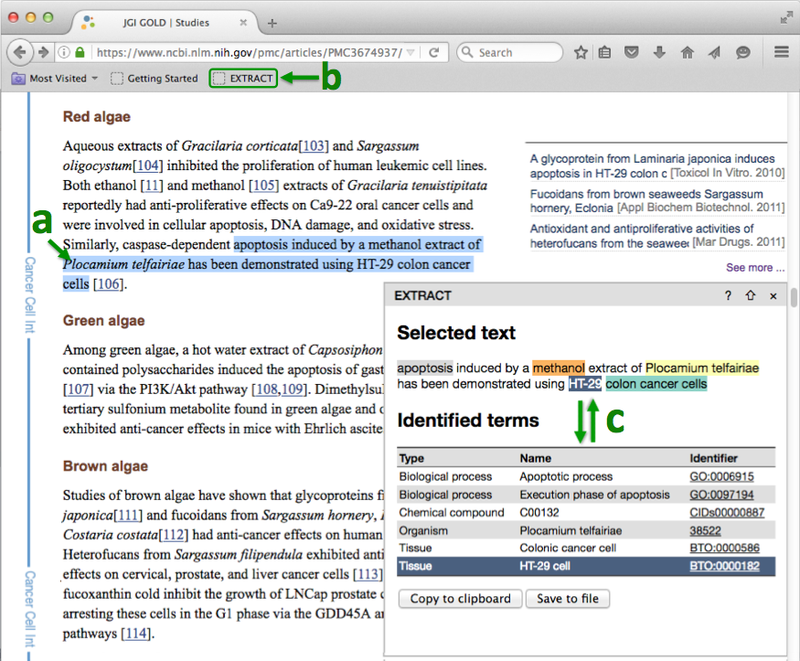 The document text used in the example above is taken from Forget et al., 2010, Geobiology (PubMed). For further information feel free to contact us (). An example Perl client that demonstrates the GetEntities functionality is available here (it's accompanying sample input file can be found here). GetHTML (http://tagger.jensenlab.org/GetHTML) returns tagged the input HTML document. The tagged entities belong to the specified entity_types. Both samples were dominated by Zetaproteobacteria Fe oxidizers. This group was most abundant at Volcano 1, where sediments were richer in Fe and contained more crystalline forms of Fe oxides. A queuing system on the EXTRACT server ensures the handling of multiple simultaneous requests. HTTP POST requests to the tagger are recommended instead of HTTP GET requests. The maximum HTTP POST request data size supported is 10MB. A more detailed description of the tagger API is available here. The document text used in the examples above is taken from Forget et al., 2010, Geobiology (PubMed). Virome / Metagenomes Online, Microbial Genomics and Bioinformatics Group, MM-MPI, Bremen, and Dr. Pier L. Buttigieg.